People wonder why Christians go to church for praying, singing hymns and listening to sermons. They may also wonder whom they are worshipping? Indeed, all Christians, Jews and Muslims believe in one Creating God who is the source of life and to whom all depend on. Most of us believe that there are more important essences than material life, such as deeds out of truth, good, beauty, faith, hope and love, which represent the eternal values desired by all human beings. We cannot understand but it is like the experience of listening to a master piece, seeing an awesome scene of the nature, or loving someone. These feelings help us develop our sense of values, distinguish right from wrong, good from bad. Christians believe that all these are related to God and that they can express these ideas and feelings to God through worship. God reveal himself to us through Jesus; and Christians worship God through Jesus. Jesus taught us to call God, "Our Father in heaven." He also said that we can share our life with God. We worship Jesus Christ because we know He is the only son of God. Jesus was a Jew and his form of worship was in the Jewish tradition. We also inherit this tradition. 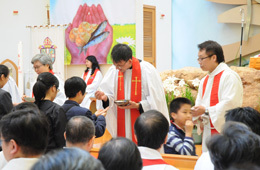 Hong Kong Sheng Kung Hui adopts the Holy Communion instituted by Jesus, which is also known as Eucharist, Love Feast or Mass. Holy Communion is a sacrament which was instituted by Jesus at the Last Supper with his disciples. We celebrate Holy Communion to commemorate Jesus and offer our thanksgiving for his redemption and receiving Him into our life. Jesus on the night when he was betrayed took a loaf of bread, and when he had given thanks, he broke it and gave it to the disciples. In the same way he took the cup also, after supper, giving it to the disciples. This is also what the Church does nowadays so that every Christian receives the blessing from God and learns to give up one-self to share with others and to allow the Lord's will be done. Communicants who receive the bread and wine also unite with Jesus Christ and fellow brothers and sisters to become Christ's body. Why Holy Communion is seen as the core of church life? It is because Holy Communion begins with the teaching of Christian faith expressed in readings and/or sermon. At the communal confession, all acknowledges one's imperfection before Jesus. After absolution, the officiating minister will consecrate the bread and wine into the body and blood of Christ by invoking the Holy Spirit. The consecration does not change the substance of the elements but has a spiritual effect. At the service, the needy and the suffering ones are not forgotten and they will be remembered at the intercession. Congregation sings hymns to express their feelings and faith. In addition, there will be reading of Psalms which was the poems of ancient Jews. The Book of Common Prayer collects a number of the Psalms. Although they are more than 2,000 years old, some Psalms on relationship are still applicable to modern society. 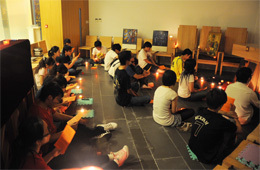 Apart from Holy Communion, Hong Kong Sheng Kung Hui also celebrates other regular and occasional services. Regular services include Morning Prayer and Evensong, while occasional services range from Solemnization of Matrimony, Funeral and Burial of the Dead, Baptism, Confirmation, Holy Order, Reconciliation to Anointing of the Sick. The order of the Holy Communion can be found in both the 1959 edition of the Book of Common Prayer and the Holy Eucharist: Rite Two. The content of both books is more or less the same with Rite Two using modern language and approach. Many parishes use both books alternately. Hong Kong Sheng Kung Hui welcome you to join its worship services. At Sunday Service, receptionists distribute service programme and welcome visitors. The order of the service, readings and hymns are printed in the programme to facilitate hassle-free participation in the worship. Receptionists will be happy to help visitors with special needs. Many people like the quietness and the peaceful atmosphere of the service and the singing of the choir. All Sheng Kung Hui churches welcome you to come and experience the worship. If you like it, you are welcome to come again.